Having a bath can be such a relaxing treat when you’re in the mood. However, once you’ve sat for a bit and the water starts to go a bit cold, the whole experience can become boring. 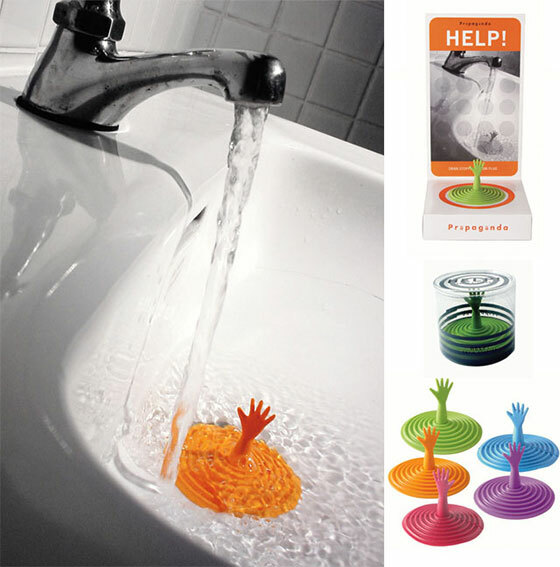 That is the reason why we need these Creative and Playful Tub Plugs and Drain Stoppers, which are sure to make one smile & are great fun too. 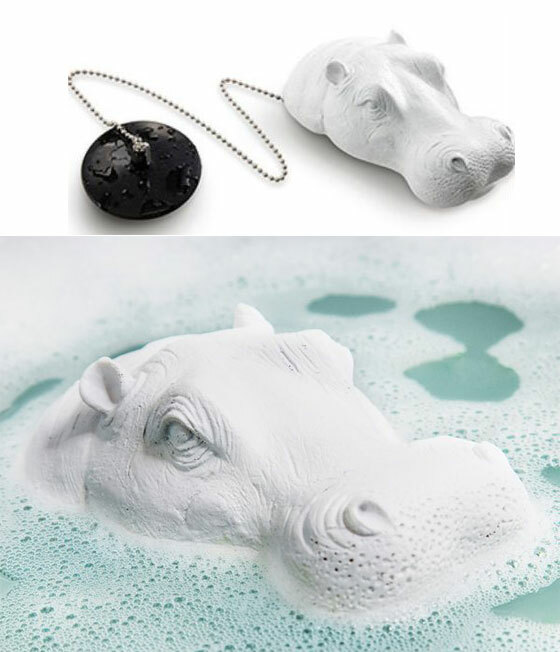 Even the most passionate big game hunter loves to bathe – and must not give up his beloved hippo while doing so. 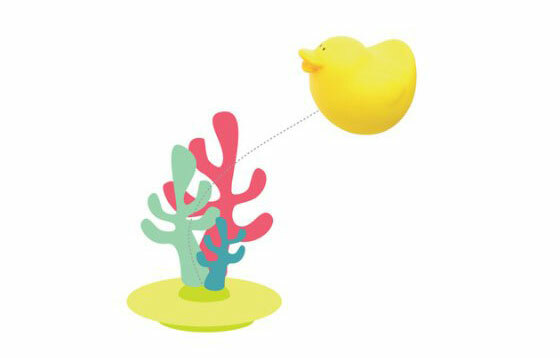 Thanks to the floater one can easily locate the bathtub plug when the foamy fun is over with. 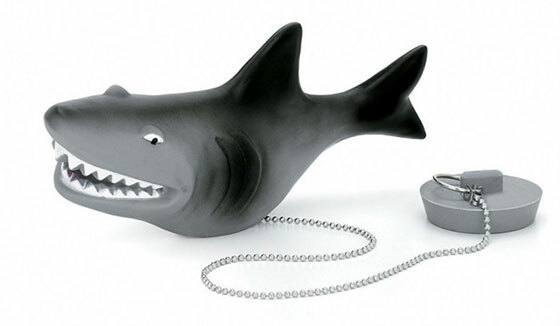 This excellent novelty bathtime shark will take in a little water and then sit below the water with it’s fin sticking out the top – just how it should do. The new and improved shark has a plug attached so that means your bath water is in capable fins. It also means an end to plunging your hand into scorching/freezing water to empty the tub. 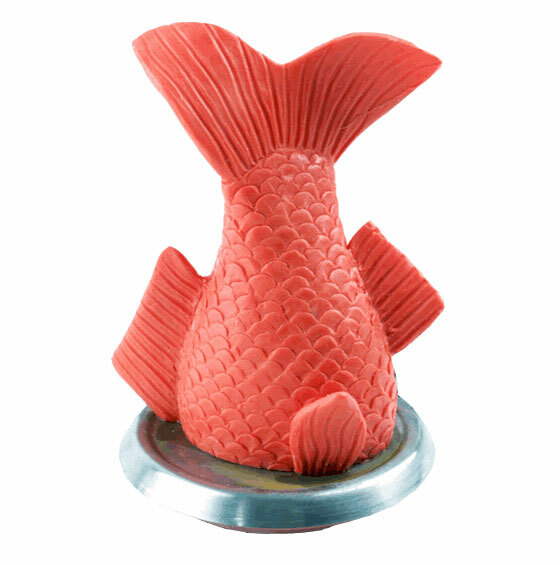 Bathtub plug in the shape of a fishing bobber, made of plastic. 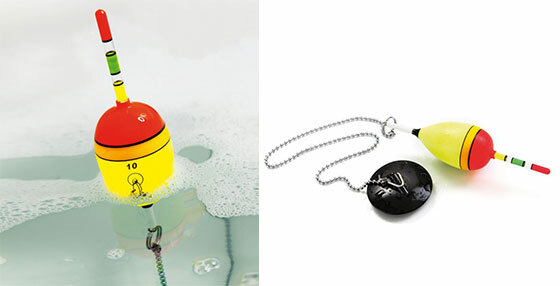 The funny, colorful bobber Swimma, attached at the end of the bathtub plug, casually floats on the water surface and gives the impression of being on a relaxing fishing trip. Swimma remains visible up to a water level of 65 cm. 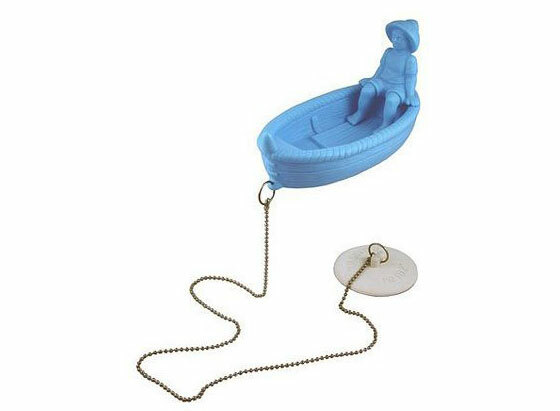 Kids will love splashing around with this great rowboat, and you’ll love all the good, clean fun ! Tubtanic Novelty Bath plugIceberg dead ahead!’; Ok, so it’s just bubble bath… The Tubtanic Bath Plug is a hilarious bathroom accessory that will look like a miniature scene from the Titanic movie. Throw in a couple of Lego people and recreate weepy scenes of Leo DiCaprio and Kate Winslet losing each other in a wave of poor acting and CGI madness. Bath time has never been so dramatic!Whether you are using Tubtanic as a bath plug or sink plug, it makes a great Birthday gift or stocking filler. If you have a nautical themed bathroom, why not add a touch of humour? Who knew you could accommodate a cruise ship in your bath tub! 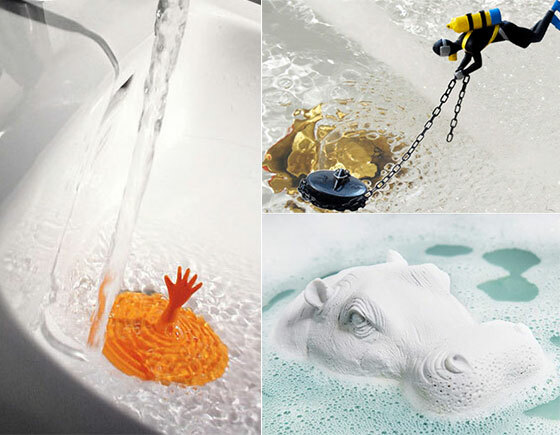 Scrub your poop deck with an aptly themed bath plug as company, thanks to Tubtanic! Make your own bubbly zen garden with this Lotus Leaf floating bath plug… Lay back and let the ambience takeover, maybe even let out a gentle “Om” – or not! 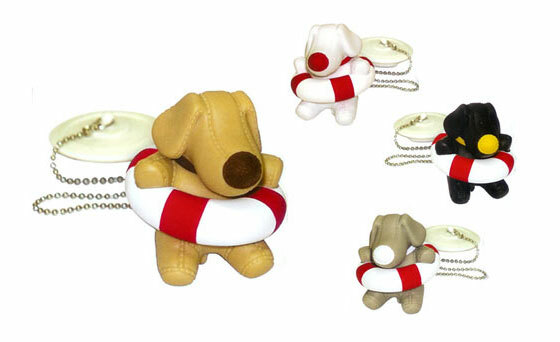 Its chain allows it to stay attached to the plug and its foam base allows it to float. Its fairly simple really. 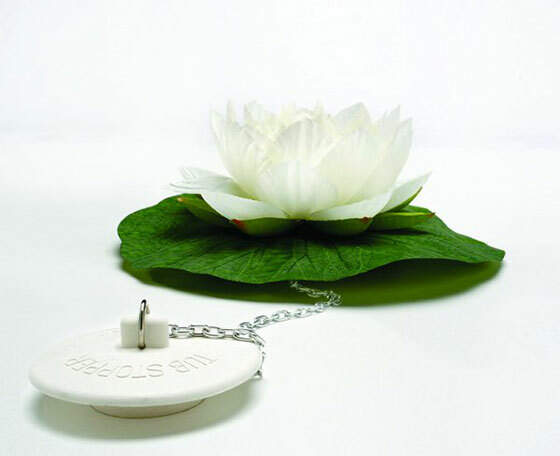 If only life was as simple as a Lotus Leaf! Man overboard! Oh wait.. that’s not a man, it’s an adorable puppy to keep you company in the bathtub. Think you’re too grown up to take a bath? Never! Grab your Mr. Bubble, floating battleship, and rescue the puppy! What better person is there to plug your bath than a scuba diver? 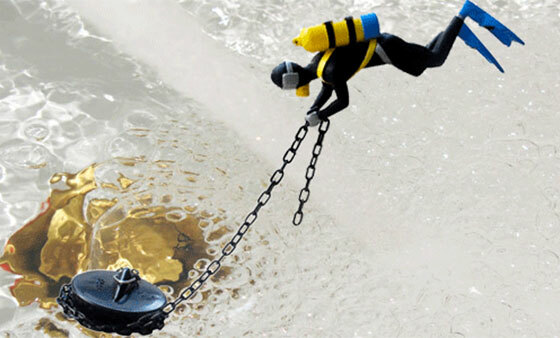 The Scuba Diver Bath Plug is an expert at stopping major leaks and will competently plug your bath whenever you need him to. He’ll even hang around whilst you have your bath and let the water out after you’ve finished. Fits all standard sized bath and sink plug holes. 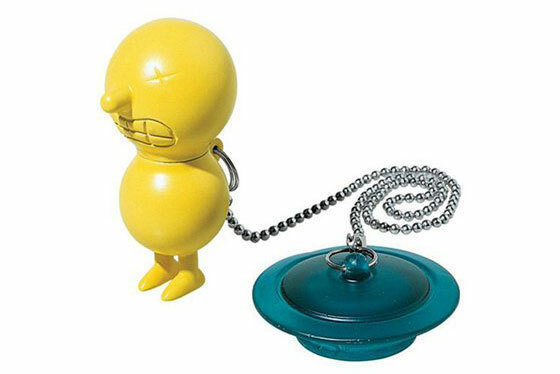 Comes on a chain so will float around around whilst you scrub yourself. Do you marinate in the bath worrying about melting ice caps and the plight of the polar bear? Well you should because despite the claims of Clarkson and co, it’s your fault! So why not cheer yourself up and simultaneously compound your angst by plugging your tub with the Polar Bear Bath Plug. Standard Size will fit most bathtubs. For 1.5″ Inside Diameter Drain Orifices.